Ms Teresa Kęsek from Polskie Koleje Linowe told skiinfo.pl, "After a long wait, skiers can finally ski in Kasprowy Wierch, part of Poland's leading Zakopane ski area. 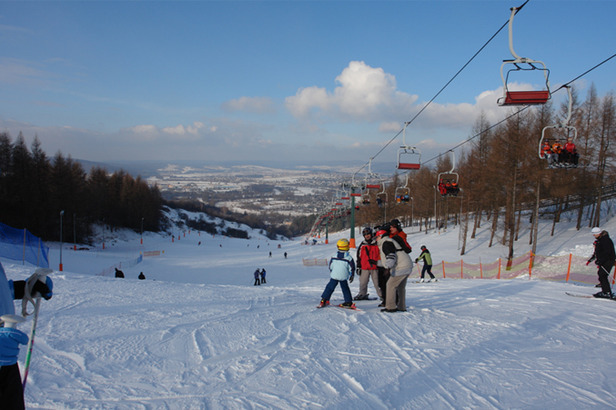 At the moment one slope in open in Kocioł Gąsienicowy. We're now waiting for the snow depth to build to 50cm when we will be able to run the Kocioł Goryczkowy chairlift. The very late opening of the slopes is because of adverse snow conditions and there being no possibility of using snowing system in area of Tatra National Park in Poland"
Dwie Doliny Muszyna - Wierchomla has the deepest snow in Poland with a 120cm (4 foot) base.